The humanitarian situation in Venezuela is dire. While destitution around the world is at an all-time low, in Venezuela, more children are dying on the streets from malnutrition and starvation today than in the 1990s. The Venezuelan government has stopped publishing mortality statistics in an attempt to cover up the disaster heralded by the regimes of Hugo Chavez and Nicolas Maduro for the formerly-prosperous South American state. Ninety percent of Venezuelans live below the poverty line. More than 1.5m Venezuelans have fled the land of their birth since 2015. Tomás Páez believes 15% of the total Venezuelan population will soon reside outside their country, with no hope of return. The root cause of this travesty is, unfortunately, quite simple: the ideology of socialism. And, particularly, socialism brought about through a regime of expropriation not unlike that being contemplated in South Africa. Vast swathes of property in the oil and agricultural industries were nationalised by the Venezuelan government in its attempt to fill the shoes left by the murderous erstwhile Soviet Union. As is the case in any socialist regime that embarks on an economic programme that will inevitably kill and destroy, the Venezuelan government soon graduated to infringements of civil and political rights. There were 31,096 complaints of human rights violations between 2011 and 2014 alone – and only 3.1% of those complaints led to the Venezuelan police taking action. In 2017, the Maduro regime ordered the closure of 49 media houses – 36 broadcasters and three television channels included. Social media networks and political websites have also been blocked. The latest example of repression in Venezuela is the ongoing constitutional crisis. Maduro unilaterally created a rubber-stamp legislature called the Constituent National Assembly, replacing the democratically-elected National Assembly. While the majority leader in the lawful National Assembly, Juan Guaidó, is today recognised as the legitimate political leader of Venezuela by the open and democratic societies of the world, those countries with a less than stellar human rights record recognise the tyrant Maduro. South Africa has thrown its support in with the latter camp, despite our constitutional values aligning with the former. Section 1 of the Constitution provides that South Africa is founded, among other things, upon the advancement of human rights and freedoms and the Rule of Law. Another value underlying the Constitution is the principle of participatory democracy. Government is not only required to adhere to the Constitution domestically but also to project the values of our constitutional dispensation in its foreign affairs dealings. As American judge Andrew Napolitano notes, “Wherever the government goes, the Constitution goes”. Judge Arthur Chaskalson noted in the 1994 Constitutional Court case of Makwanyane that the State must demonstrate its commitment to South Africa’s founding vales “in everything that it does”, which necessarily includes foreign policy. Foreign relations have long been treated as an ‘extra-constitutional’ affair whereby government can do as it pleases without regard to the constitutional imperatives of advancing human rights and freedoms, and the imperative of public participation. Supporting Maduro, whose regime does not represent any of the values our society holds dear, is a flagrant affront to the goals and spirit of the Constitution. Furthermore, not one South African citizen was asked whether they support Maduro’s regime, meaning government has received no democratic mandate to endorse the Maduro presidency. Public participation is rarely contemplated by government in its handling of foreign affairs. After several conversations in the last few days I am optimistic that the @Europarl_EN will pass a resolution tomorrow recognizing @jguaido as the legitimate President of #Venezuela. This will be an enormous step forward in bringing the Maduro crime family to its overdue end. 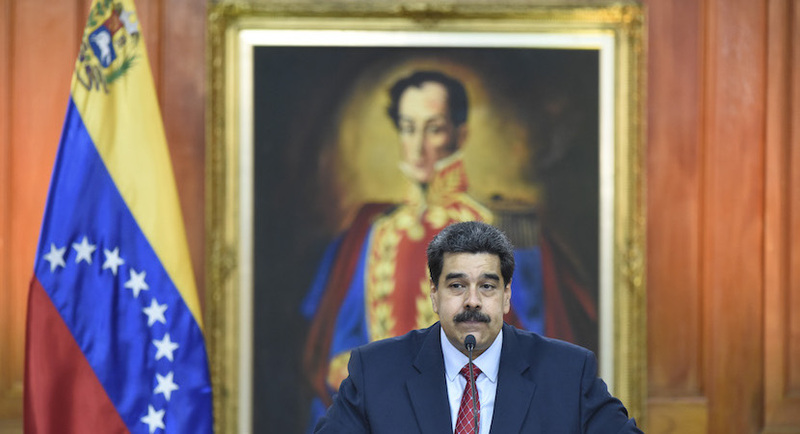 At the end of the day, unfortunately, the South African government’s endorsement of the Maduro regime does not come as a surprise, nor is it inconsistent with previous conduct. To name but three examples: in 1998, South Africa withdrew its recognition of the liberal-democratic Republic of China (ROC) to give it to the authoritarian-communist People’s Republic of China (PRC); when government, in direct defiance of a court order, facilitated Omar al-Bashir’s flight from justice so he can continue oppressing the people of Darfur; and the granting of diplomatic immunity to Grace Mugabe after she battered a South African citizen, despite her not having been on official diplomatic business in South Africa. The reason for this is simple: expedience over constitutionality, and ideological camaraderie over respect for justice. The Constitution has had little influence over foreign policy, which is effectively regarded as being under the absolute power of government, immune from any system of values or constraint. While this might be expedient for government, it does untold damage to our international reputation. It is past the time to rein in government’s abuse of the “South African” name on the international stage.